Toshiba Qosmio G35-AV600 is powered with latest Intel Centrino Duo Mobile Technology and is the ultimate 4-in-1 portable home entertainment media center that enables users to enjoy stunning visuals, unbeatable graphics, excellent sound and integrated media experience with 17″ diagonal Widescreen XGA+ Ultimate TruBrite LCD (1440×900), Toshiba-unique QosmioEngine, NVIDIA GeForce Go 7300 high-performance graphics card, NTSC TV tuner with QosmioPlayer, double-layer DVD SuperMulti Drive, 1-bit Digital Amplifier and Harman/Kardon enhanced Bass Reflex speakers. 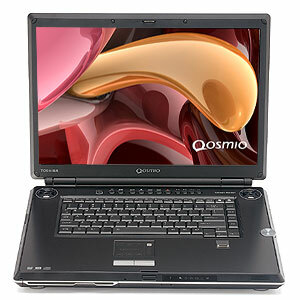 Bottom Line: The Toshiba Qosmio G35-AV600 offers the most complete set of high-end ultimedia features of any Media Center laptop available. Pros: A plethora of A/V features. Multifunctional touchpad. Fingerprint reader. Intel Core Duo Processor.